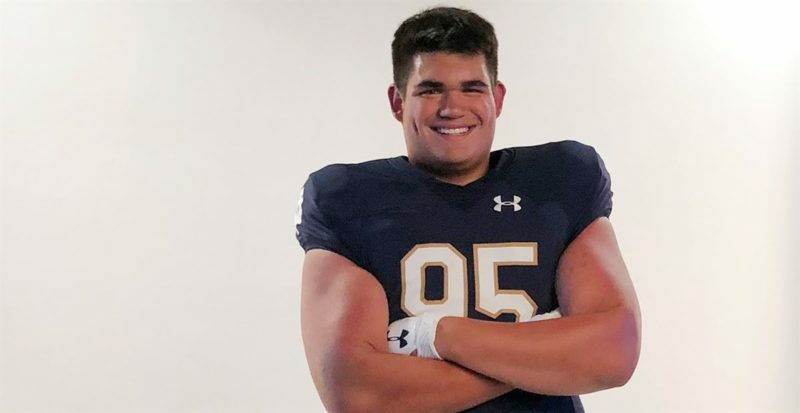 Notre Dame football received its first post-2019 Signing Day commitment for the 2020 class today, as four-star defensive tackle Aidan Keanaaina has decided to verbally commit to the Fighting Irish. 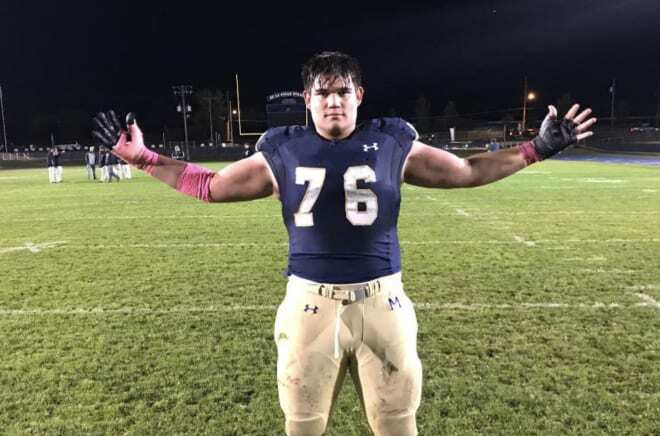 The 6’3″/300 pounder out of Denver, CO is the 5th commit overall for Notre Dame’s class of 2020, and the 2nd on the defensive side of the ball. Aidan received his offer from Notre Dame back in May of last year, and has visited campus twice already since then. This was a move that had been expected for a while now, but he just recently announced that he would be making his decision public today on his birthday. Aidan chose the Irish over other offers from Ohio State, Michigan, Penn State, USC, Oregon, Florida, UCLA, Wisconsin, and others. Ohio State was reportedly the biggest competition in this recruitment. Aidan’s highlights show a guy with a high motor and a lot of power behind that motor. He does a great job of eating up space at the line of scrimmage. He plays with good leverage and consistently fights his way through double teams on tape. And in a few clips where he’s lined up more as a 3-4 DE, he shows decent pass-rushing ability for a guy that will likely end up at nose tackle at the next level. Aidan adds immediate depth for the Irish at the nose tackle position. The Irish have done pretty well for themselves recruiting along the defensive line over the past few cycles, and The Big Kahuna continues that trend. 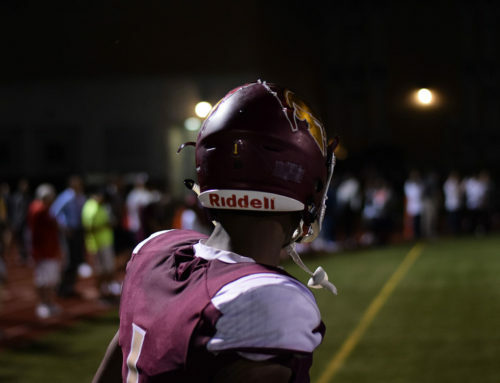 He already possesses the size to see the field in his freshman year, he just has to work on things like explosiveness and continuing to build power. The staff will likely use the new redshirt rules to get him on the field some in 2020. With Kurt Hinish graduating after that season, I’d expect Aidan to be a regular in the rotation at nose tackle in 2021. Welcome to the Irish family, Aidan! I don’t know a damn thing, but that kid looked pretty powerful to me. He seemed to track the ball carrier real well too. Is he getting such mediocre scores based on competition? The athleticism probably isn’t there to be ranked a bunch higher, IMO. He’s freaking huge, one of the recruits who actually looks every bit of his listed height. During some camps after his sophomore year he looked really, really big. Almost bloated. It looks like he’s slimmed down quite a bit since then. AK has the largest legs I’ve ever seen on any recent Irish verbal, too. I wouldn’t be surprised if he’s 340 pounds at Notre Dame. Guys that big just aren’t going to have super high ceilings. But he could be a great gap-eating player. Also, whomever sewed his jersey numbers on needs to be fired. Didn’t he make a ridiculous amount of tackles? There has to be some level of athleticism to track down that many dudes. 69 tackles, 32 solo, 4 sacks in 2018. Never mind. It looks like Jamie agrees with me. The kid is huge. 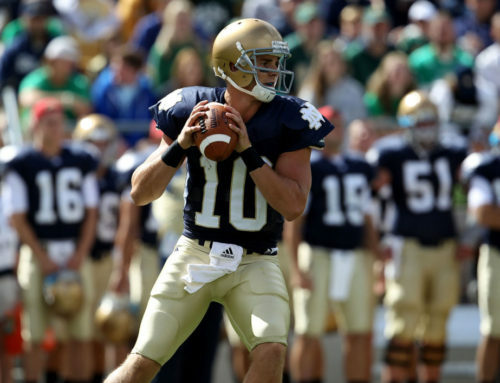 His bone structure and hips alone are as big as players now at ND or even bigger. He works out 3-5 days a week off season at a place called six zero and continues to work on get off, rip and technique. He will definitely be in the rotation as a freshman. He is already working out as a red-shirt his senior year in HS. I can see an excellent D-Line for ND ahead. They all (D-Line)work together as a team. You can tell he has slimmed up. Weighs at least 305, but I can see him at 315 lbs playing weight. His legs alone are Hugh already. Coach like the speed so having him at 340 would not have that speed. The future is bright for the D-Line!